Welcome to the Elfpack Poem Bosses! 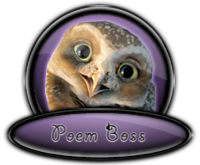 The Poem Bosses are those who are in charge and regulate all poetry related events and features within Elfpack -- contests, the Elfpack Daily Poem, and Elfpack Poets. If you have a question pertaining to any of those, these are the people to ask! Mischievous [Morgoth]: The "Supreme Commander" of Elfpack Featured Poem. He makes sure all the Featured Poem Bosses are doing their assigned duties, appoints new Featured Poem Bosses and retires those who are inactive or not working correctly. - Malevolent [Stephen] The "High Czar" of Elfpack Poetry. He makes sure all the Poem Bosses are doing their assigned duties, appoints new Poem Bosses and retires those who are inactive or not working correctly.